From turnkey double expandable trailers to sophisticated simulation vehicles that give trainees operational experience, Triune provides customized mobile solutions that meet our clients’ military and government objectives. Select from our many trailer solutions and models before outfitting your trailer to fit your exact needs. Take advantage of high-tech tools such as Cat 5e and Cat 6 internet cabling, night vision camera surveillance systems, custom HVAC units for desert and cold weather applications and bulletproof applications (round size, velocity and distance considered). For additional exterior customizations Triune can install auto-deploy rooftop satellite systems (up to 2.4 miles) with a vertical lift for clear sight vectors and rooftop observation decks with interior and exterior access points. Triune is also capable of major installations from customer-supplied systems. If you have your own equipment and technology, Triune can drop it into your specified trailer model. If you can think it, we can build it. All equipment leaving the Triune facility withstands rigorous quality testing and Triune will undergo all necessary background checks prior to gaining access to government facilities. Safety, security and confidentiality are taken seriously at Triune. 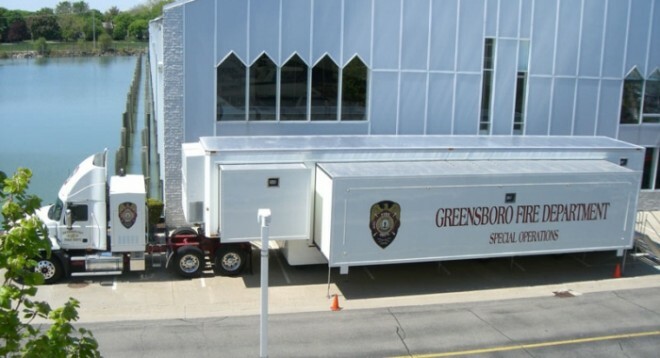 We are proud of our 100 years of combined experience in specialty vehicle design, manufacturing and on-time delivery, and our long-standing tradition of building out top-notch government and military trailers and vehicles.